"I've heard of a lot of cases of skewers sliding in track ends & as a new KM owner, i'm worried about it happening to me. I'm currently using Sun Ringle Disc Jockeys with Salsa QR skewers. Anyone here using these? Any feedback? My 1st ride was in a technical man-made trail...0 problems but slipping is still at the back of my mind. I just want to have peace of mind & confidence in my equipment because it will make me a better rider." I ordered some XT skewers per some of the suggestions on here. We'll see how they do. The only thing about tug nuts is they don't help on the non-drive side slip (from discs). i use 15-year-old Deore LX QRs on the back of my 26er and i've never had issues with slip. oddly enough, the thru-bolt on my 29er has to be cranked on big time to prevent slip. Shimano makes the absolute best MTB QRs. Use them and a properly adjusted tensioner on the drive side and you won't have any problems - might not even need the tensioner if you aren't very rough. I was worried about the same problem with my Jabberwocky. I read up on sheldonbrown.com, the SS guru, and he states that as long as you use shimano xt skewers you will be fine. They work like a charm. I had track nuts slip on my FG cross bike. I have also heard of people throwing a left side one on to counteract the disk brake 'creep' that has also happened to some. so if steel nut (ie: Shimano) skewers don't do it for you, score a couple of 'tugnuts'. Correct me if I'm wrong, but isn't what you call disc brake "creep", mean that the wheel actually slips BACKWARDS, instead towards the front of the bike? In which case, the tugnut wouldn't help at all. I believe On-One tried to counter-act this by placing the disc mount between the seat and chain stays. I've heard it produced mediocre results. I don't have XT qr (shimano deore or something) and a chain tug and the only times I ever deal with chain tension is after I get a flat, which sometimes means a month or two of carefree riding. Scuffing the paint down to bare metal on the dropouts will help too. You need Surly Tugnuts. You only need one. Two is overkill. See the little donuts there? it works with standard QR skewers. It prevents the skewer from moving forward. I use it on my off road Land Shark, and never looked back. I already have a Tuggnut on the drive side. I know that the Tuggnut on the drive side will help prevent forward slippage & rearward slippage is non-existent (correct me if i'm wrong) since the chain is pulling the cog forward...but what about forward & rearward slippage on the brake side? Should i put another Tuggnut on the brake side so the only thing i have to worry about is rearward slippage? Regarding quality of skewers, is there really a huge difference between Shimanos vs. other brands? the Salsas that i'm using are pretty tough...but i'm still worried. it's not about quality but design. 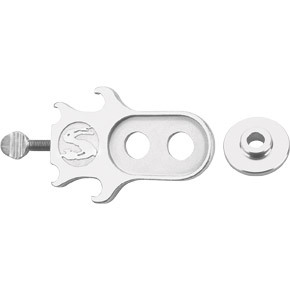 Internal cam skewers like Shimano can clamp down harder than an external cam skewer like Salsa. Here's another vote for Shimano XT Skewer. Got one on my Jabberwocky and not once have I had any slip issues. dgaddis - Did you sand down the paint in the dropout? Debating whether to do so on mine. If you did, any surface rust pop up after a while? I haven't sanded the paint off the track ends, and still no slippage. Good to know. Thanks, vindd. Ok, i'm gonna get some Shimano skewers. Thanks everyone! Any specific Shimano model? Would XTRs be the best or would Deores be good enough? XT is what i have been using. XTR might be overkill, but whatever boats your float. Nope, it won't happen. You're not pulling on the brake side. Just stopping, which won't affect anything, just saving you from hitting a tree. So another tensioner won't make sense there. I promise. Well, the disc brake forces will drive the wheel out the back of the dropout with the standard configuration. On one explains it well, which is why they mount their calipers between the stays. A decent XT skewer will be sufficient to hold the wheel on the place on the disc side. That's about all you can do. It works fine with my Pugsley. 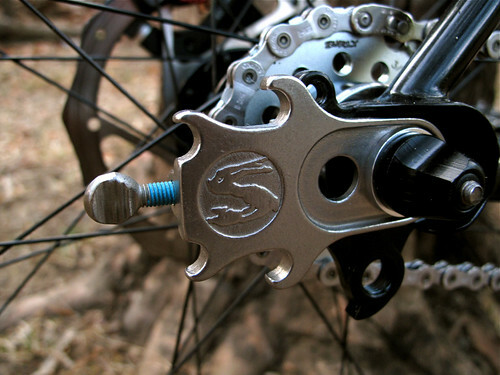 The XTR has a ti rear skewer (used to at least) and the steel actually generates more clamping force. For disk brakes and especially on a SS the XT is the way to go. Misaligned dropouts ( faces slightly out of plane with each other) will cause skewers and track nuts to clamp unevenly and then later slip. It's worth checking if this continues to be a problem. @Live Wire - It's not really a problem, yet, & i hope it won't be in the future. I was just warned by the LBS owner where i bought my KM that they had some KM owners that suffered from slippage. I also read some testimonials in some forums about this so i'm taking precautionary measures to prevent this. Thanks anyway for the advice, much appreciated. Might have good luck with something like this if used with tensioners! Oh, yeah, i saw this somewhere! This is worth a shot! Thanks Dave! No problem! Also, a little spendier option, you could do the DT Swiss RWS Skewers. They clamp extremely well! Redline @ $11 for the pair. They worked very well. I've since sold them and re-installed the stock tug. yeah, your reasoning is sound, as the slippage would go WITH the tug direction. I had thought that it had more to do with creating more surface area for the QR to clamp to the dropout. Maybe Not? so yes, overkill and probably NOT necessary. although it is nice to have the little screw to adjust tesion on both sides, and I do like the look of both intact. Last edited by p nut; 07-13-2010 at 07:40 AM. skewers are taboo. get some bolt on hubs! Has anyone tried the crank brothers skewers? I would guess if they really do give you more leverage to close them tighter (as the few reviews I've found online claim they actually do) that they would help prevent any slipping. I ordered some of the Crank Brothers and they broke on me after about 5 times of clamping/un-clamping. They warrantied them and sent me another pair. I've put skewers on a million times, but thinking that maybe I was doing something wrong (since the Crank Brothers skewers are a little different design) I took them to my LBS to show me how to use them. They broke two days later just riding the trail. The clamp just popped and released tension on the wheel. Maybe I've just had bad luck with them, but I would seriously consider trying a different brand. PS - I used a2z Ti skewers that I got off ebay for $15 and they've been nothing but amazing for about a year now. I know they're not big name brand, but hell, they work!! To those who suggested/are using XT skewers, i have a question for you guys. I just got a set of XT skewers from a seller in my local forum for around $20, brand new/unused. I'm kinda worried that the skewers i got aren't XTs because i compared them to my current XT skewers & they look identical aside from the markings. My XT skewers have "Shimano XT closed" printed on the levers while the ones that i recently bought have "Shimano closed" etched on the levers like on the 105 levers. The seller said they came from an XT wheelset. Can anyone clear this out for me? I don't think they're XT's. Probably just Shimano Deore. Most of the XT wheelsets I've seen come with either Deore or lower end skewers. 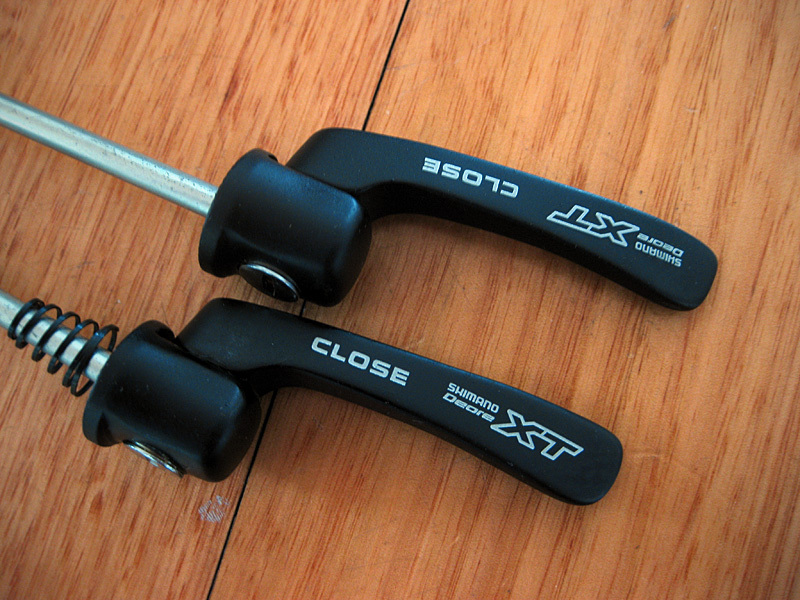 Also, all of my XT skewers have "XT" written on them--including a set from 1997 and 2008. 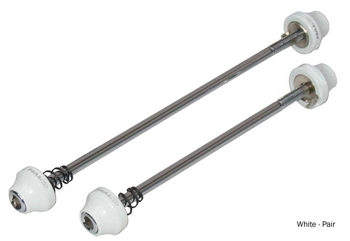 What's the functional difference between the XT and other enclosed cam shimano skewers? I just got a wheelset that came with the second skewer pictured. Total speculation but I can't imagine there's any difference. It would probably cost Shimano more to have two separate production runs than to sell the Deore or LX skewer with the "lesser label" with identical spec at a lower price. Personally I've experienced excellent binding capabilities with every Shimano skewer I've ever used, and those simply look way too identical for me to believe there's any difference except the marketing factor (ie: label). Once again, this is pure conjecture on my part, tho. Mine moved on hard landings and from using the rear brake hard until I serrated the fork surface a bit with dremel. Even with shimano skewers and a tuggnut on the drive side. thanks for the replies. guys! I'm actually ok with what i've bought, i just don't want to think i got duped by the seller. It really looks identical to my XTs, except for the markings. @p nut - I'm sure they're not Deores because those have different shaped levers & have holes on the end of levers. Yeah, I think they're pretty much all the same, anyway. Except for the weight? Actually have to take that back, bugger moves still, just slower.